The Dry-Crimp wire connector is a two-part system that allows installers to first crimp wire and test for conductivity, and then secure with a waterproof housing. 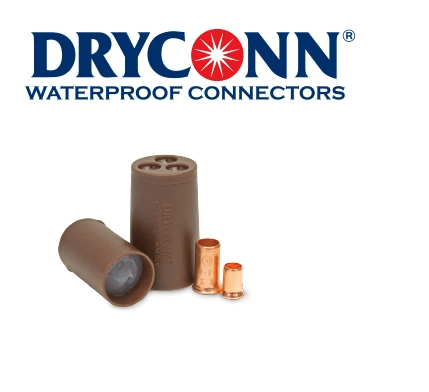 There are two crimp sizes available to cover a wire range between #18 and #10 AWG, and the waterproof housing is filled with a dielectric silicone sealant to ensure a waterproof and corrosion proof splice. The three holes in the housing tightly seal around wires (or seal when no third wire is used) to ensure continuous splice protection.